Dolomite/dolostone = CaMg(CO3)2. 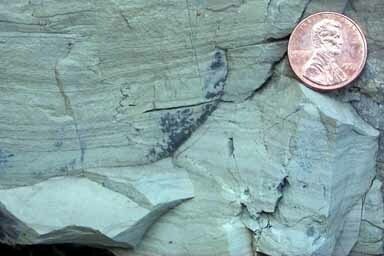 Rock probably began as a calcitic rock (CaCO3) (an algal laminated micrite), but was converted to dolomite after formation. In this detail we can more easily see the algal laminates (faint horizontal laminations running from left to right). Also notice the gray, almost chalky appearance; this is typical of dolomite. With experience dolomite can be recognized on site with outneed for an acid test. This rock, by the way, reacts very weakly with acid, producing very fine bubbles, slowly.